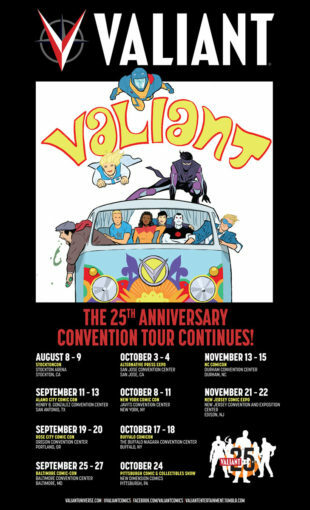 Valiant’s 25th Anniversary Convention Tour Adds Four New Dates for Fall 2015! Winter is almost upon us, but Valiant Entertainment’s 25th Anniversary Convention Tour is going strong with four more stops in its cross-country celebration of the largest independent superhero universe in comics! First, from Saturday, October 17th to Sunday, October 18th, Valiant is headed north for Buffalo Comicon 2015 – and we’re heating the weekend up with thrilling panel presentations, creator appearances, and a top-flight selection of comics! All weekend long, join Valiant at the Buffalo Niagara Convention Center’s Upper Level, Section E, to learn why Valiant is the hottest publisher in comics with a selection of Valiant’s Volume 1 trade paperbacks and hardcovers, including X-O MANOWAR, BLOODSHOT, NINJAK, THE DEATH-DEFYING DR. MIRAGE, and many more – making for a perfect ground-floor entry into the award-winning Valiant Universe! Then on Saturday, October 17th at 12:00 p.m. in Room #106 B+C, come aboard with Valiant 101: New Fans Start Here – a concise and fun-filled introduction to Valiant’s biggest, most memorable characters! Looking for where to start with Valiant? Then this is the panel for you! From X-O MANOWAR to NINJAK to DIVINITY and QUANTUM AND WOODY, find out for yourself why Buzzfeed calls Valiant “a universe full of your new favorite superheroes” right here with an easy, one-stop panel presentation from Valiant staff and red-hot artist Adam Gorham (DEAD DROP)! We’ll see you on the road!